Problem: When I open SVG files, they don't show up on the mat! 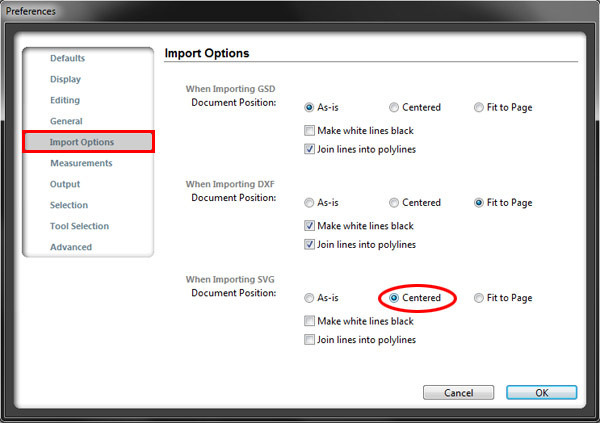 Solution: Because SVG files contain coordinate information, some of our files may import OFF of the cutting area. We've got a quick fix for that! That's it! You've successfully configured your software to automatically center SVG files! Note: If you don't have this option, you'll need to update your Silhouette Studio software by visiting Silhouette America's website. Oh my goodness, THANK YOU! This was making me crazy! I also had this “situation”. Now it’s so easy and great to open files and view them in the cutting area. OH my I never knew that existed. Thank you for sharing. I hated playing find and seek with some of my opened files, especially if it happened to be a light color. So I’m not having a problem in SDS I can’t get my most recent project in SCAL 3 to open. I click once on the file and can see it but when I click to open the file the mat changes to 6×12 and nothing opens. The file you are trying to access is not supported. Can someone please help? Irit, please use the contact form and email us directly so we can assist you.